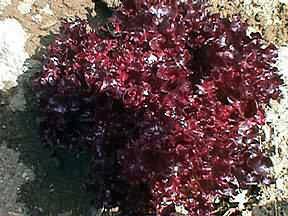 This is my red lettuce in the month of May 2000. 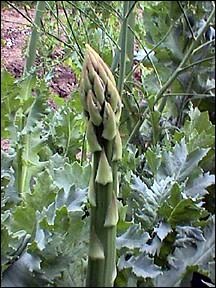 It is now done producing and has gone to seed. 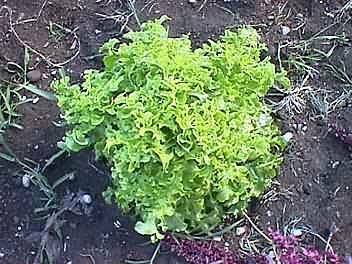 I always let my lettuce go to seed so I will get volunteer lettuce in the spring. For some reason lettuce will not sprout in my garden if I plant it. I either have to depend on volunteers (and hope that I see them so I can save them from the hoe) or plant the seeds indoors. This year I planted red lettuce indoors and the Green lettuce came up volunteer. 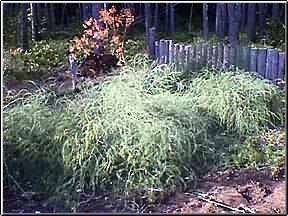 The green lettuce pictured above in the month of August 2000 is starting to go to seed. It will blossom in about one week.